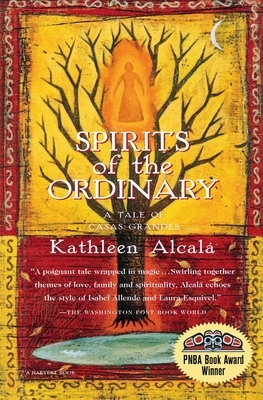 Spirits of the Ordinary: A Tale of Casas Grandes (Paperback) | Eagle Harbor Book Co.
A spectacular tapestry of folklore, spirituality, and landscape, this extraordinary first novel vividly blurs fantasy and reality as it details one family's search for identity. In a small village in northern Mexico, the Carabajals have long been practicing their Jewish faith in secret. The father, Julio, spends his days dabbling with alchemy. His wife, Mariana, cannot speak but is clairvoyant. Their son has allied himself with a Catholic woman and is obsessed with his search for gold. Central to the surprising destinies of these characters are the momentous events and the ancient and sacred cliff dwellings of Casas Grandes, high in the mountains. This story of two cultures, of the elusive bonds of love and faith, is dazzling in its originality. It is for all readers who loved Allende's The House of Spirits or Esquivel's Like Water for Chocolate. Kathleen Alcala is the author of Mrs. Vargas and the Dead Naturalist and Spirits of the Ordinary, a highly praised novel that received the Pacific Northwest Booksellers Assocaition Book Award.